A Roman walks into a bar, holds up two fingers and shouts "Five beers, please!" But disregarding the funniness, it made me actually think about the real system or systems that they did use. The evidence I found so far is from quite old sources and inconclusive, only pointing at reconstructions at what they might have used. Roman numerals are even said to have originated from hand-gestures for counting, according to one hypothesis. 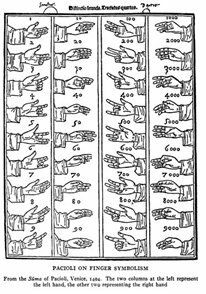 The evidence seems to be against the assumption that the ancient Greeks and Romans had a system of representing higher numbers by placing the hands with palm or back exposed against various parts of the body as described by Bede. […] At this point we shall leave Bede for the reasons stated at the beginning of this section and consider some earlier evidence which shows that despite the general continuity of tradition, a change had taken place in the way 10 and 30 were represented. Which seems to imply that apart from a seemingly arbitrary system in large parts to start with an even as randomly appearing change happened? Plautus, Miles Gloriosus, 204‑206; Pliny, Hist. Nat. 34, 33 (cf. Macrobius, Saturnalia 1, 9, 10); Suidas s.v. Ἰᾶνος; Cicero, Ad Att. 5, 21, 12‑13; Quintilian, Instit. Orat. 1, 10, 35. But it is not without good reason that some of the greatest men have devoted special attention to this science. Geometry has two divisions; one is concerned with numbers, the other with figures. Now knowledge of the former is a necessity not merely to the orator, but to any one who has had even an elementary education. Such knowledge is frequently required in actual cases, in which a speaker is regarded as deficient in education, I will not say if he hesitates in making a calculation, but even if he contradicts the calculation which he states in words by making an uncertain or inappropriate gesture with his fingers. 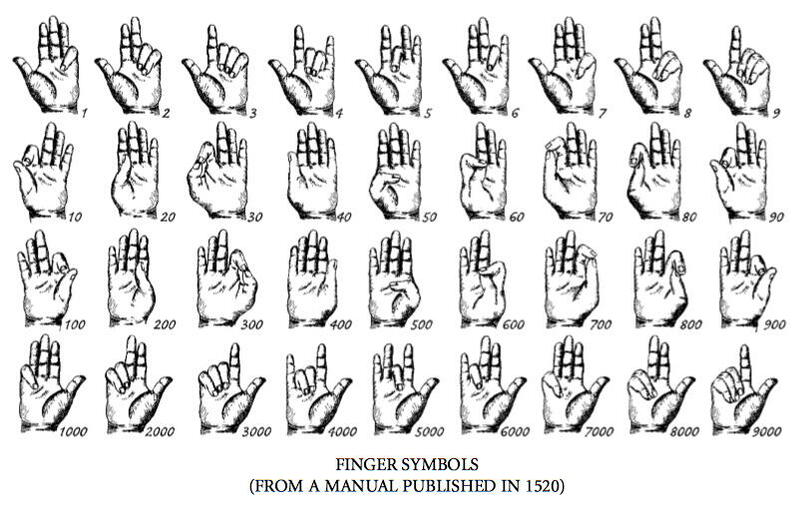 How did the Romans use hand gestures to signal numerical values, did that system change over time, and is any of those steps conducive to the theory that written representation evolved from these finger signals? While the connection between calculations, means thereof and written number representation is interesting as well indeed: The main focus here is specifically concentrating on counting, use of fingers and visual communication (body language, like it's used today). If simple counting with fingers should be an aid in (learners'?) arithmetics that should be most interesting as well. All the sources clearly state that there is no actual record of how Romans performed mathematical calculations. However it is well established that the Romans knew of, and used, the abacus. 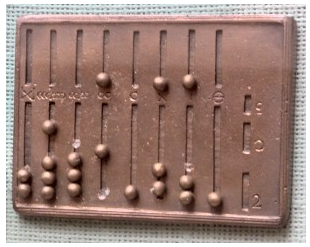 It is also trivial to see how the Roman Numeral system was a literal representation of the results shown on the abacus in non-subtractive mode. Finally, it is well established that accomplished abacus users exceeded even pocket calculator users well into the 1980's except for abstruse calculations, and Richard Feynman; but then Feynman seems to have been a perpetual exception. "Raios cubicos!" he says with a vengeance. Cube roots! He wants to do cube roots by arithmetic. It's hard to find a more difficult fundamental problem in arithmetic. It must have been his topnotch exercise in abacus-land. He writes down a number on some paper— any old number— and I still remember it: 1729.03. He starts working on it, mumbling and grumbling: "Mmmmmmagmmmmbrrr"— he's working like a demon! He's poring away, doing this cube root. Meanwhile I'm just sitting there. One of the waiters says, "What are you doing?". I point to my head. "Thinking!" I say. I write down 12 on the paper. After a little while I've got 12.002. The man with the abacus wipes the sweat off his forehead: "Twelve!" he says. "Oh, no!" I say. "More digits! More digits!" I know that in taking a cube root by arithmetic, each new digit is even more work that the one before. It's a hard job. He buries himself again, grunting "Rrrrgrrrrmmmmmm ...," while I add on two more digits. He finally lifts his head to say, "12.01!" The waiter are all excited and happy. They tell the man, "Look! He does it only by thinking, and you need an abacus! He's got more digits!" Early in the project [Feynman and Bethe] were working together on a formula that required the square of 48. Feymnan reached across his desk for the Marchant mechanical calculator. Given these facts, there seems no reason to imagine or invent more complex calculation techniques that what we already to know the Romans to have possession of - an inexpensive, accurate and exceedingly efficient calculator that remains in use in Asia even today. Today we are all taught in Grade School that both accuracy and precision of our answers is vital for marks. However in the real world answers are rarely calculable to infinite precision - and a couple of decimal places is often more than sufficient. The ancients well knew of the Secant Method for solving roots of functions, which requires no Calculus and converges rapidly, even if less so than Newton's Method. That is what Feynman is doing above in calculating cube roots - and it hardly matters for this purpose which of the two he uses as both will be much faster than even a Master of Abacus. We would do our children a great service if we taught them younger the beauty or true Arithmetic, and that there are many different ways to evaluate each problem, depending on the precision required at the moment. I was fortunate to stumble on this myself, through reading, at a tender age. I dismiss the entire notion (use of finger counting) as fantastical - a schoolboy prank gone wild. First, roughly a quarter of those finger positions are impossible on my hands without physically breaking fingers. Another quarter or so are extremely painful to hold. Then the thought of attempting to combine two such on the same hand is mind-numbingly terrifying. Then both hands at once - not happening. Note: Non-subtractive mode is the representation of 4 as IIII instead of as IV; of 9 as VIIII instead of as IX; etc. This page displays many Roman era testimonies that there was a system, and that it served to count at least up to the hundreds. I'll copy here the most important ones. The king of Pylos (Nestor), if any credibility you give to the great Homer, was an example of life as long as that of the crow. Hugely lucky he who avoided his death for so many centuries and already counts his years with the right hand and has drunk the new wine so many times! If you had said thirty years old instead of ten, we may have thought that you had made a mistake in the act of numbering and you had opened the fingers you should have had in a circle shape. But forty, which are easier than any other to be expressed with the opened palm, which you increase in a half, cannot be an error in the gesture of the fingers, unless, thinking that Pudentilla is thirty years old, you have counted them double because of the two consuls there are every year". In the processes some tasks or questions to check the participants ´skills on the use of numbers are very common and in them they are considered ignorant not only those ones who hesitate or doubt on the sums, but those who fail on the account by the wrong or clumsy gesture of the fingers as well. Bdelycleon (the one who hates Cleon).- Listen to me, dear little father, unruffle that frowning brow and reckon, you can do so without trouble, not with pebbles, but on your fingers. According to Professor Michele Scolari's blog (Italian), an analogous system existed in Persia. It was descripted in the Persian dictionary Farhangi Djihangiri (XVI century), but Plutarch speaks of "finger calculations" at the court of the Persian King Artaxerxes III, who lived between the fourth and third century BC. *Scolari suggests that indigitatio, the art of counting with fingers, originated in Egypt - traces of it can be seen in a group of scultures (which he calls Censimento del bestiame ("Livestock census"), though I'm failing to identify this group or at least its English name) displayed at the Egyptian Museum in Cairo - and then spread to the Greco-Roman and Persian worlds. Alberto Angela in his A day in the Life of Ancient Rome gives credit to the system, giving (Italian) another depiction of it as well as stating that a consequence of this counting system can be seen still today, in how people count in some souks in the Arab world. Angela states that numbers up to 10000 could be expressed with fingers, combining the two hands. But obviously a number like 1234 would be expressed in 4 steps, not (impossibly) all at once albeit with the two hands, as the other answer misleadingly puts it. 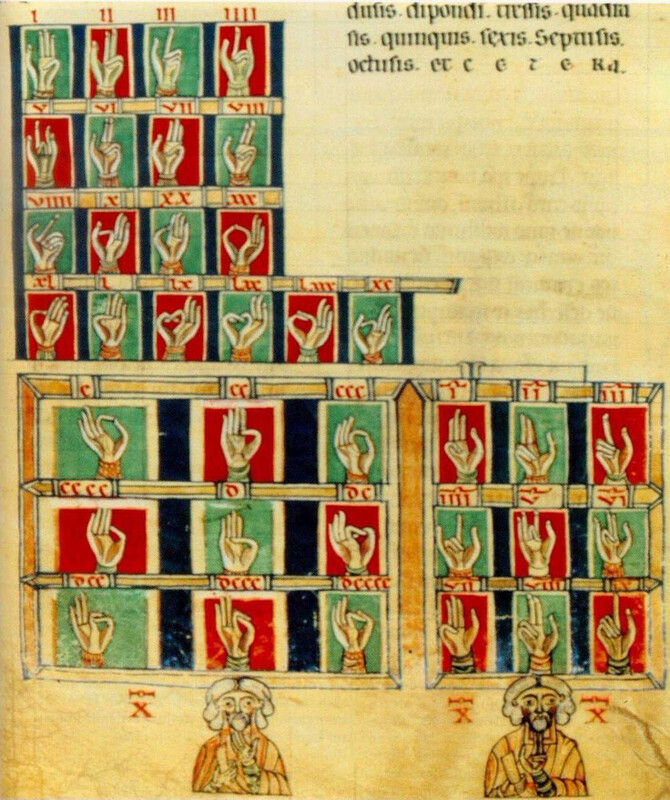 Given that the Romans read from left to right and wrote numbers starting from the largest "digit" (like MCCXXXIIII), it's safe to say the steps would be: first, make the sign for 1000 with your right hand; then, make the sign for 200 with that same hand; then make the sign for 30 with your left hand, and finally make the sign for 4 again with your left hand. Did Roman unmarried men have a preferred hand and finger for wearing their seal ring? Did the Romans install offensive statues in the temples of conquered territories?